I am a big believer in treating yourself as and when you can or when you feel you need it. Whether it’s with a shopping spree, beauty treatment or even just a 20 minute sit down giving your brain a rest with tea and biscuits, i think it’s so important. For me at the moment it’s a relaxing treatment which also happens to help my skin (BONUS). I don’t have time at the moment to go to an actual spa so i went to the next best thing…Calma Beauty. 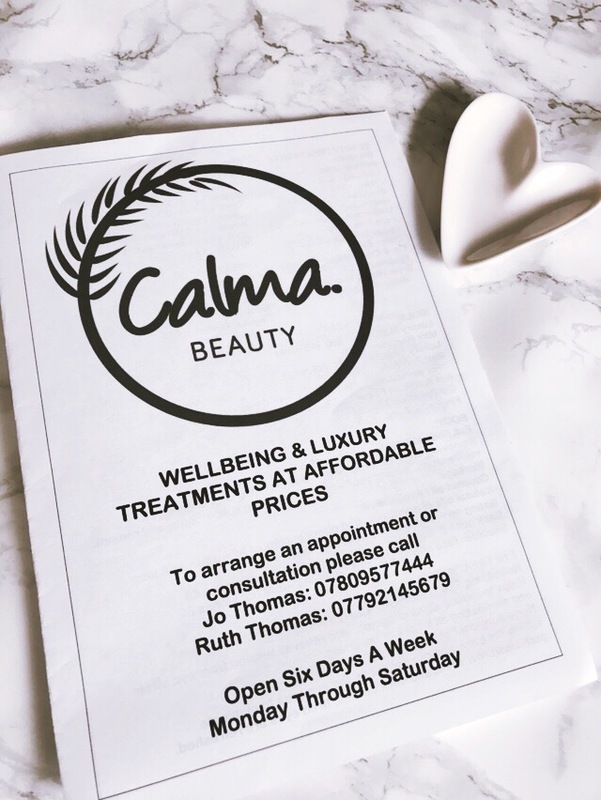 It’s a family run business by one of my friends (Jo) and her mum which offers well being and affordable treatments and because of the location it means you miss out on any noise which is fabulous especially if your after some of that quiet we spoke about. I have promised myself i will once a month try a different treatment based on the advice given there which is also amazing (i had no idea how much i was doing wrong). I learn something every time i go. This time i was given the chance to try out the ‘Saving Face’ Facial which i am super grateful for as it was amazing. This type of facial is specifically tailored to the individual and their needs to achieve the best result. It’s only £28 and includes a scalp, face and shoulder massage which is an absolute bargain and so relaxing! As you can see on this list of treatments the top one is the one i had. 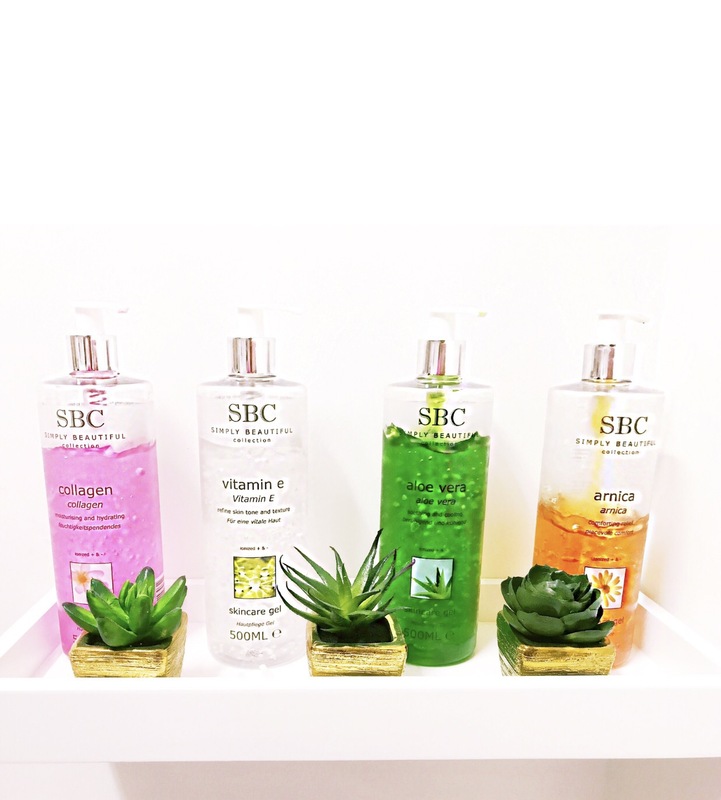 After Jo looked at my skin she opted to use vitamin E which she describes as a comfort blanket to the skin along with Aloe Vera gels as she said my skin was dry and dehydrated. Jo used Avocado oil to massage my face and shoulders and the scalp with lemongrass oil. The whole treatment was amazing and with all the products my skin smelt and looked so bright and less dull straight away. While i was laying there we were discussing my skin routine. I always find i try something new but if it doesn’t do what it says on the tin in a few days i give up which is why my draws are full of beauty and skin products. I also don’t moisturise my whole face as i thought it gave me spots and clogged my skin (oh was i wrong). Jo told me the reason why i think i have oily skin is because i am not moisturising and so it is over producing oil which is infact why i am getting spots (who knew). As i have sensitive skin she told me to use raw Coconut Oil every night which you can buy at Holland & Barrett (has to be raw). Neutrogena pink grapefuit scrub every morning which unclogs pores by gently exfoliating the skin as it contains micro-beads followed by Pixi Glow Tonic (we all know how amazing this is) and she advised it can be used daily for a brighter more even skin tone. For moisturiser Jo advised i could either use coconut oil or for a less shiny look in the day the white Nivea Soft cream which can be used daily and isn’t hard on sensitive skin, it also absorbs quickly so it is subtle enough to wear in the day. I picked mine up for £2 in Asda so it isn’t expensive if you want to test it out. I will also be using my Kiehls Midnight recovery concentrate which a night time oil and promised to restore youthful skin twice a week as if i use too much it makes my skin slightly irritated (those sensitive vibes). One of the key ingredients is Lavender Essential Oil which helps soothe inflamed or irritated skin while helping reduce skin blotchiness for a more even look. Another brand Jo recommended is Dr Organics – especially their coconut range which they also offer an eye cream which i will be purchasing. As her skin is also sensitive skin she uses this and if you check her Instagram you will see how unreal her skin is (so I’m sold). You can buy the range at Holland & Barrett also. 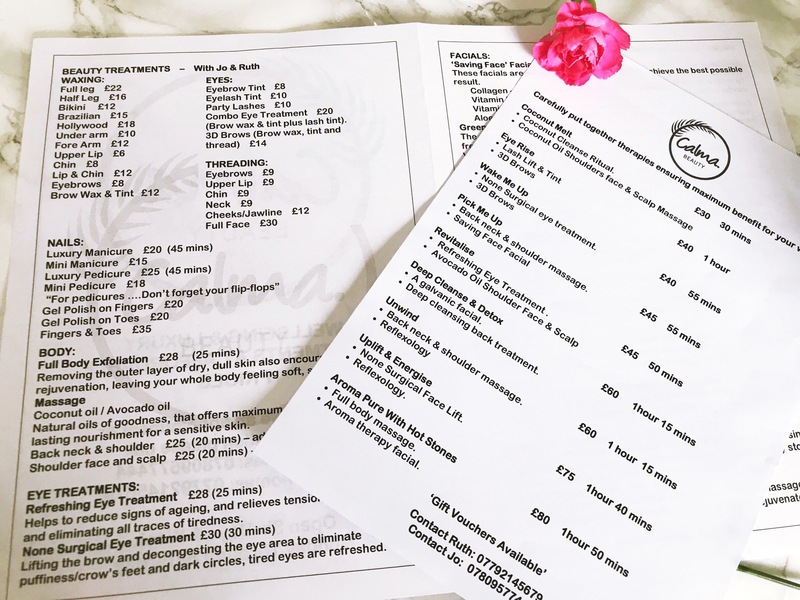 As you can see below Jo & her mum offer a range of treatments and also advice…i will link their Instagram below and if you need any questions answering about skin or want to book an appointment head there… i promise it will be worth it! 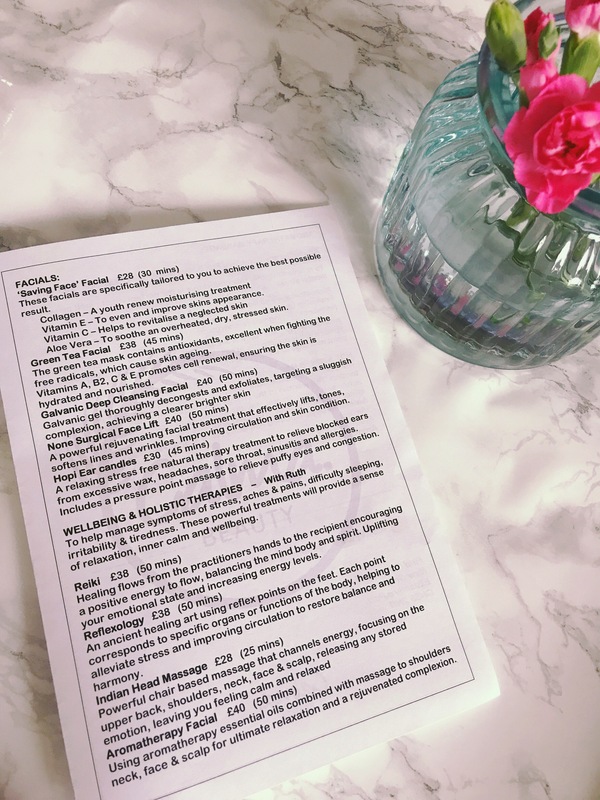 I think on my next visit i am going to try the coconut Melt which Jo said i would really benefit from due to my skin being so dry and also Hopi Ear candles (let me know if you’ve had these) as i have always been intrigued! I also suffer with hay fever which Jo said this can help so i am definitely willing to try. If your like me and don’t have time or the money to spend on spa days i would definitely think about booking here, it’s just as good if not better! I will let you know how my new skin routine goes and more treatments i try.